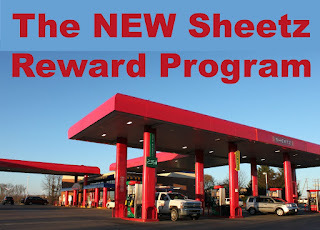 One of my most visited blog posts is The Ultimate Guide to the Best Deals at Sheetz so I felt I needed to write a blog post about what I currently know about how the Sheetz reward program is changing on April 5, 2017. This seems to be the year for changes to loyalty offers as My Coke Rewards is changing and the last day to enter codes is March 22, 2017. Because Sheetz is my favorite loyalty program with My Coke Rewards a second, I have to wonder what is in store for 2017 with anything else I participate in! One of my favorite things with the Sheetz program has been the buy 10 get 1 free offers. In my guide to the best deals at Sheetz I suggested saving your free items for MTO products for a more expensive one. For instance, I love the meatball and pepperoni subs. (If you haven't tried the pepperoni sub on wholegrain with extra marinara sauce, you are missing out!) If I save these credits and redeem them for a $9 six inch sub (which can be possible), then here is the breakdown of what I am spending and the rewards on that item. This is my speculation as to why the rewards program is changing. But it is changing radically. Under the new program, from what I understand, nearly all items are included in earning rewards. The exclusions are typical for other similar programs such as CVS. For example you don't earn any credits on milk, gift cards, tobacco, etc. However, my spending is primarily at the MTO, so I'm not going to benefit from purchasing things like candy bars, antifreeze, or bottled soda. Under the new program, you earn five points per dollar spent. Information is not completely available to the public yet, but from the limited information that has been released, you need to earn 250 points to redeem for a fountain drink, soda, cookie, coffee, or donut. As you can see, the reward earned for a fountain drink has dropped by almost eight cents. The value of the rewards of the sub in this scenario has dropped by 86 cents! There are also levels with additional rewards. To become a "friend", you must spend $200 at Sheetz inside the store within a year. To become a "freak" that amount raises to $500. Sheetz has said our current credits for free items will be converted to the new card, and any credits that have not earned a free item will be converted to points. I am planning on trying to round out all of my items before the new program begins because I would rather have free items earned under the old program than points for the new one since there are too many unknowns. Will we be able to earn rewards in store on more expensive items such as six inch subs? If so, what will the points be required for redemption of those items? What type of items will be available (and what will be point required be) through the website? Right now, I'm waiting to decide if this is going to be a good or a bad change based on my spending habits. I love the current program, and hope the new one will be as good if not better, but from what I have seen so far I am reluctant to say this sounds as if the change is for the better. All I can do is hope it is!